"I am giving up my coffee fixes or runs for 1 year. Instead, I am donating the money...That is the challenge I pose to you." Toronto’s temperatures have dropped in the early days of November, it’s that time of year when a warm cup of coffee is the next best thing to home. This is the perfect time to cozy up to a warm cup of coffee and listen to Christmas songs while waiting in line at the bus stop. In this spirit of giving, I am giving up my coffee fixes or coffee runs for 1 year. Instead, I am donating the money to independent relief operations lead by some of my highschool friends in Bantayan Island, in the North part of Cebu in the Philippines. That is the challenge I pose to you. Bantayan island was one of the hardest hit by Super Typhoon Haiyan. Cebu Governor Davide states about 95-98% of homes and buildings are destroyed, power is cut-off and communication lines went down (source: Epoch Times). The Bantayan Mayor estimates that it would take them three months to recover. In this season of hot lattes and apple cider, I am reaching out to you to consider sharing your THIRD CUP of coffee to the local people of Bantayan Island. I am raising awareness and seeking donations to support a couple of relief operations that will be focusing on the remote coastal areas of Bantayan Island located in the Northern part of Cebu, Philippines. $5 CAD - on average the cost of a medium latte in Canada. $5 CAD - could feed a family in Bantayan Island for a day or go towards purchases on sleeping mats, blankets, basic supplies like food, drinking water, medicine, medical supplies, candles, flash lights, lamps and camping tarps. Why choose to donate to Bantayan? Just like coffee, Bantayan owns a big space in my heart. 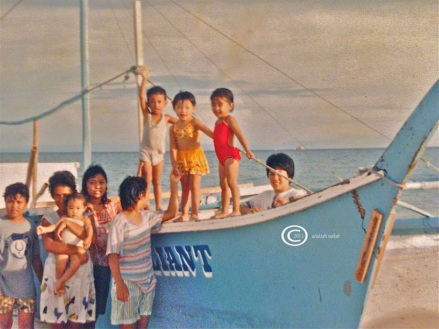 I always tell people, I live in Toronto, was born in Cebu but was raised in Bantayan (my mother’s hometown). My family would bring my siblings and I along with my mother's eight other brothers and sisters to get away from the city. Before coming to Canada, I also spent four years going to highschool there. Bantayan is one of the smallest islands in the Philippines and access is limited. It will take some time until major relief operations get to little islands like Bantayan and it's surrounding 20 islets, hence why we are communicating to local volunteers on the island. The volunteers are covering the cost to transport the goods to these islands, your donation will go towards purchasing sleeping mats, blankets, basic supplies like food, drinking water, medicine, medical supplies, candles, flash lights, lamps and camping tarps.